DroidRzr.com, Droid Ultra, Droid Maxx, Droid Mini, Droid Razr, Droid Razr HD, Droid Razr Maxx, Droid Razr Maxx HD, Droid Razr M, Droid Bionic! Many devices will require you to use a passcode/phrase/pattern on the first unlocking of a device. The investigators in this case must have been quick to act or were fore-thinking enough to not restart or turn off the device..... So, food for thought. Perhaps a new feature should ensue in that your primary pass-"thing" should be required beyond a particular length of time? The Android N Preview program has expanded beyond the Nexus line to include the Sony Experia Z3 ! In recent weeks, Google had announced that they were going to start making the preview available to devices outside of the Nexus program. Looks like we have our first in this series with the Z3. This requires manual flashing - no beta program ota. However, once installed, Sony will update via OTA when available. Google is stepping up their game and posting the OTA zip files to their developer site for the Android N preview to take you from 1 to 2. The idea of receiving OTA's for preview software is just down right awesome and this little nugget makes it even more so - alleviating the need for a PC to update and not having to wait for the OTA to be pushed. Just a side note - having played with the 2nd version yesterday, it is definitely worth getting off the 1st version if you are running it as a daily. Much more stable and the added features are a definite plus. Keep in mind though, that being preview software and the security concerns that inherently contains, Google blocks the use of Android Pay and that will more than likely be the case throughout the preview period. 36,000 Verizon employees went on strike today 04-13-16. While these employees aren't of the wireless division, but of the landline and FiOS division, this is still the largest US strike since the previous Verizon strike back in 2011..... Wait, did you get that? Yes, the previous largest strike was against Verizon as well.... This should say something, it does to me- however, I will keep my comments at bay on this one. They have been working since August without a contract and the union has finally said, enough is enough, bring us something worth discussing while we wait outside. The corporation has been moving some jobs offshore to offset the loss of those divisions, despite the extreme growth their wireless division. Your service to us is greatly appreciated ! To all of our members here: God bless you all. To all our Veterans here: My thanks and special prayers. To all who served. To those who didn't return. I have a neighbor who is in his late 70's, and his health unfortunately is slowly deteriorating. I was out raking leaves one day last month, and he came out. I had met him before. We started talking, and he told me served in the Army. I thanked him for his service. He looked at me, and there was a gleam in his eye. No words were needed. We both knew how great it felt for him to hear that. After about a minute of silence, we started talking about yard work, and families, and the upcoming winter, and the apple orchard that used to be where my house currently sits. We talked for about 45 minutes. He could have talked forever. He told me next time we would tell me some stories from his Army days. I told him I looked forward to it. And now, the rest of the story.... I saw him talking to another one my neighbors last weekend while I was once again raking leaves. My next door neighbor disappeared, and a few minutes later had two beers. He gave one to the Vet. My neighbors drank and laughed out loud several times for over an hour as I raked. Please, thank a soldier today, past or present, if you see one. 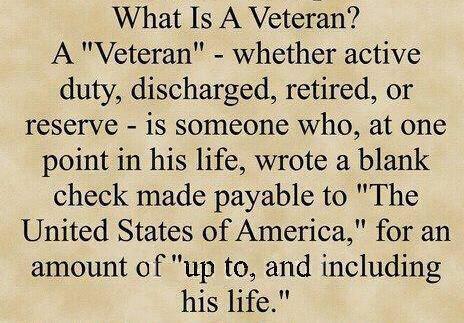 I never thought about a vet in these terms. Wow. Honestly, I try to treat every day like veteran's day. They deserve so much more than what they receive. Having the support of the people who's freedom they are protecting goes a long ways. Also, think of it in family terms. Most people will do anything for their immediate family up to and including death, yes? What a veteran has done is to extend an opening in their family to each and every one of us regardless of our faults, hatreds, etc. It is only right that we extend our own hands to them as family. No? S6, S6 Edge, S6 Edge+ or Note 5 ??? Plan on using Samsung Pay? Yes, then take a look at this. With the activation and successful card set up in the Samsung Pay app, fill out the form from their website and they will send you a $50 rebate.